Big Rigs 'n Lil' Cookies: Fishin'! 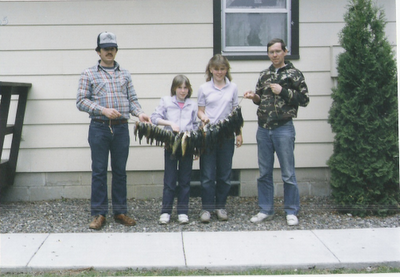 Growing up, my family often went fishing. I think at least a couple times a year. We didn't have much for fishing nearby, so a weekend trip usually included fishing. This is the last time I went fishing, which if memory serves correctly, was in 1984. My family, met my aunt and uncle, on Bay Lake in northern Minnesota. I remember the trip well, and was proud of myself for learning how to fish with minnows. I think my uncle even let me drive the boat on this trip. Fast forward twenty eight years. Truckin' Man and I are trying to learn how to take time to relax and do something that doesn't involve working! We have talked about fishing since we met, and we finally went two weeks ago! Truckin' Man bought the princess a pink fishing pole. We (he) only caught this guy, and had to throw him back. I thought he was pretty, so took his picture anyway. I Love fishing! Such a nice relaxing thing to do! Loved this post! !